Copyright � December 10, 2001, Associated Press, Inc.
WEST COLUMBIA, SC(AP) - Students who collected more than $500,000 for New York City firefighters to repay a 134-year-old debt of kindness received a personal thanks. Four members of Ladder Co. 101 thanked the students who sold T-shirts, baked cookies and collected the money in the weeks after the Sept. 11 attack. Seven firefighters from the ladder company died and the station's ladder truck was destroyed when the World Trade Center towers collapsed. The money will be used to buy a new ladder truck for the company in the Red Hook section of Brooklyn. "The outpouring of support helps to ease the pain," Capt. Tom Calkins said as the firefighters fought back tears. "The heart of America is right here in Columbia, South Carolina." The gift repays a debt incurred when New York firefighters bought a hose reel wagon for the city of Columbia in the 1860s. 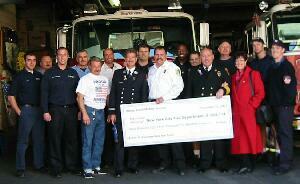 The students originally collected $354,000 and presented a check to firefighters in New York on Thanksgiving Day. As word of the effort spread, an additional $152,000 poured in from across the country. The extra money, which the school gave to the firefighters Wednesday, means a more expensive ladder truck can be bought for the station. "Your gift will help us rebuild the New York City fire department," Capt. Tom Giordano said. The new truck will carry a plaque bearing the names of the station's firefighters killed Sept. 11 and commemorating White Knoll Middle School's efforts. The people in South Carolina used some Southern hospitality to make Calkins and his fellow firefighters at home. They were given barbecue sauces from around the state, grits and a football signed by Clemson University head coach Tommy Bowden and several players. "We have been here less than 24 hours and we have been treated like kings," Calkins said.